The next Technology Tuesday will cover Lecture Capture and Podcasting with Podcast Producer 2: Podcasting is quickly gaining acceptance in higher education as a way to deliver new and supplemental academic content, research results and marketing/sports content. Podcasting is also being included with and playing a key role in many institution's pandemic planning. In this presentation we will cover the basics of how institutions are using podcasting today, as well as demonstrate some of the options available for content creation and delivery from any type of computer and smart podia. Mac OS X Server includes a service for automating the capture, encode and delivery process - Podcast Producer 2. With Podcast Producer you create workflows to automate the entire process making this solution very cost effective and easy on the support staff. Keith Mountin is the Higher Education System Engineer for Apple in Wisconsin. He lives in Juneau, WI. He has been with Apple, Inc. for 15 years. 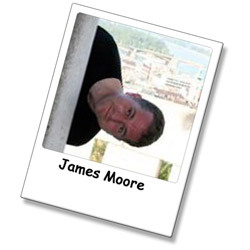 He has extensive experience working with educational institutions in the midwest. As the Education Systems Engineer for the upper midwest, he is responsible for developing and implementing technical solutions for Universities. Keith is a Certified Apple System Administrator and a Certified Apple Trainer. 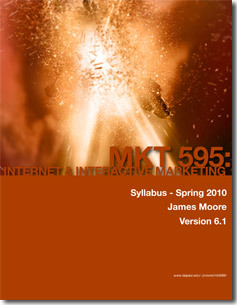 I have posted a temporary version of the syllabus for the Spring 2010 (March 29 - June 7). I will be making some minor changes over the week and will post version 6.2 shortly. Registration is available through Campus Connection. More information about the course can be found on the MKT 595 webpage.